Overnight we released a handful of new features that have been in high demand. We’ve also beefed-up reporting. We’ve included the highlights in this email, along with an experiment we’d like to tell you about. We’d like to try something a little different. We’d like to see if we can outpace Google searches, Ads and Partner referrals for getting the word out about Simple Sales Tracking and we’re asking for your help. If you find Simple Sales Tracking a useful tool for you, and you know of someone else who might also, tell them. Then, let us know! We don’t want to know who, what or where. Just send us an email to let us know you did. To sweeten the deal, in about a week we’ll pick at random 10 people and send each a free copy of Seth Godin‘s latest book, Linchpin. We’ve added a new “Save & Add New” button, which will speed things up when entering multiple sales at the same time. Clicking the button saves the current sale and opens a new blank entry form. We’ve also added a new “Clone” button, which will copy all of the data from the sale you’re viewing at the time, into a new sale entry form. If you’re creating new sales that are each similar to each other, this should help to speed things up. In the past you were limited to the length of Note you could enter for a Sale. Although that limit was large, for some, it wasn’t large enough. So, we’ve blown the cap off entirely. Notes can now be as long as you like. We’ve also increased the document storage space limits from 50mb to 100mb on Full Accounts and 5mb to 10mb on Limited Accounts. In the near future we’ll also be making an announcement regarding unlimited document storage and overall enhanced capability in this area. Stay tunned! In the past, you were not able to set the Status, Scale or High/Low/Actual Amounts during the Lead Import process. We’ve changed this so you can set each of those per record at the time of importing. This release introduces a number of new capabilities surrounding reporting. With all Lead, Opportunity and Account reports you can now filter your results based on a date range of when they’re created. Also, you can filter based on the data from your User Defined fields. 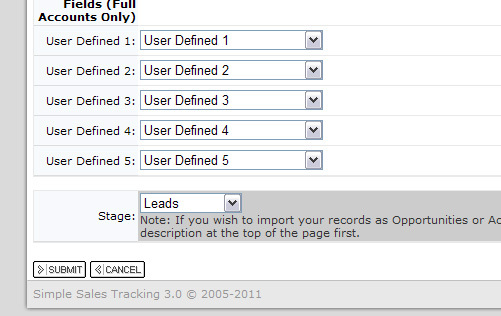 Additionally, we’ve added a report that will return ALL data fields for Leads, Opportunities, and Accounts. We’ve added a brand new report called the “Pipeline” report, which returns a combined list of Leads, Opportunities and Accounts based on the pipeline they’ve followed. Filtered by date range, you can view, for example all Leads which where converted to Opportunities and all Opportunities converted to Accounts over the past month. Finally, in addition to pdf and excel exports of reports, you’ll now have the added capability of saving the result of a report in MS Word document format. Thanks for your feedback and suggestions. You’ve helped to make Simple Sales Tracking a top CRM choice for Small and Medium sized businesses from around the world. Up until now, searching using the search box located on the Start Page has been limited to the names of Leads, Opportunities and Accounts. In our latest release, we’re pleased to announce the introduction of a more full-featured search. Search will now take into account both the Name and Details of Leads, Opportunities, Accounts, Tasks and Notes. From time to time we’ll get a question about the differences between Leads, Opportunities and Accounts. Here’s a quick blog post to help clear it up. 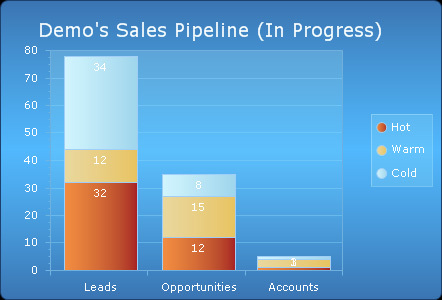 Lead -> Opportunity -> Accounts represents a progression in the sales pipeline. So, in many cases a sale starts as a lead, becomes an opportunity and then an account in that order. 2. An opportunity could then be the next stage, where you’ve spoken with someone and they’ve indicated that they are in fact interested in what you’re selling. 3. An account would be finally that they’ve made the decision to buy from you and they’re now you’re customer. Each of the forms in Simple Sales Tracking for these look very similar on purpose – to provide a smooth transition for that pipeline.